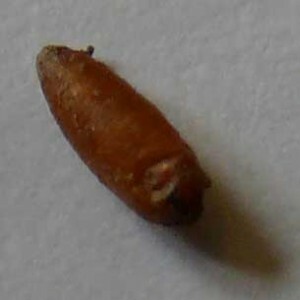 Pupa are red-brown, & 5 mm. partial or total failure of seedlings to emerge. Seeds often tunnelled and the maggots can be found inside the developing root or stem. 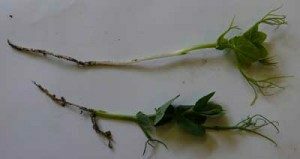 malformed seedlings due to damaged stem & leaves – if growing centre is damaged the seedling ’snakes’. Damage is caused by the larvae of the bean/pea seed fly, which develop from eggs laid on the soil surface and feed on the germinating seed. The larvae turn into pupae, which can be found in the soil around the damaged seedlings. use stale seedbed, as the fly lays eggs in freshly disturbed soil. 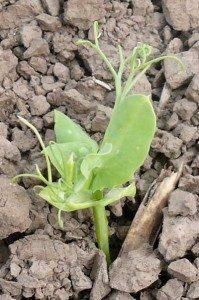 Bean and Pea seed fly can cause severe damage to peas and beans in the garden, but the severity of attack depends on the season.